I have a lot of problems with The South. Anyone who’s known me for more than a minute (or, in some cases, has seen me on facebook and nowhere else) can tell you that I’m prone to a long, rage-filled diatribe at the mention of grits, Garth Brooks, Strom Thurmond, South Carolina, Southern Baptists, South America, or the little-known Hitchcock film, South by Southeast. There’s a good reason for it–one that’s not xenophobia. See, there was a time when I didn’t live in Tennessee. When I lived in a region of the country that had seasonal weather and did not look on Democrats as a scourge to be smote by the power of the Tea Party. This place, which, I’ve learned, is heavily romanticized in my imagination, is Ohio. 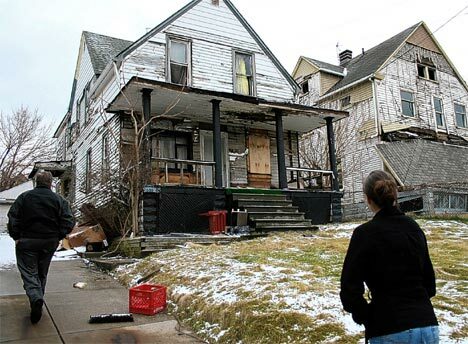 How I see Canton, Ohio in my mind. And then, as it tends to happen, the Universe sneezed and my Mom, dog, cat, and I moved to Smyrna, Tennessee to live with my grandmother. You probably don’t know about Smryna, but that’s okay. Most people don’t. 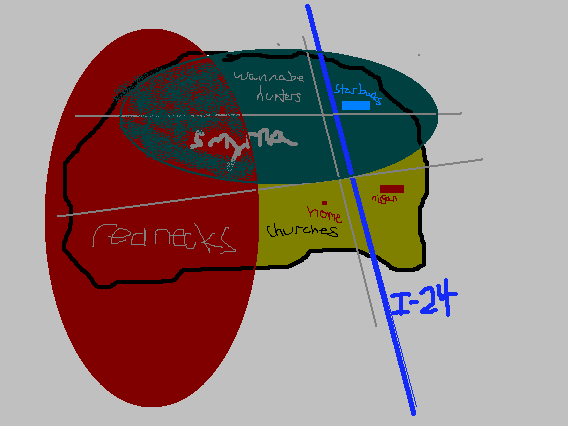 Since there’s no representation of the town close to how I remember it, I’ve taken the liberty of drawing an AaronMap ™ of the town. Before you ask, no, it’s not to scale. And no, it’s not really in the shape of what the town looked like. Pictured: rednecks, wannabe hunters, and churches.